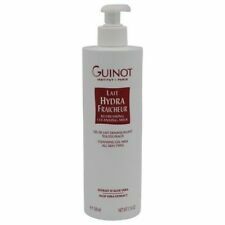 Guinot Hydra Tendre Cleansing Cream is a rinse off facial cleanser, which eliminates impurities, leaving the skin clear and healthy. It is suitable for female and males and ideal for sensitive skins. Lait Hydra Beauté. Comforting Cleansing Milk (Salon Size). Lotion Hydra Beaute. 500ml Salon size. Comforting Toning Lotion. Alcohol free. Suitable for dry, mature or sensitive skins. To use: Apply morning and evening with a cotton pad. Shea Oil extracts soothe in this cleansing milk. 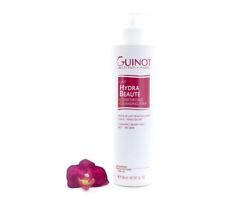 Guinot Lait Hydra Fraicheur Cleanser. 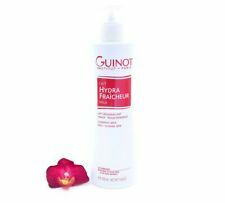 GUINOT LOTION HYDRA FRAICHEUR TONER. 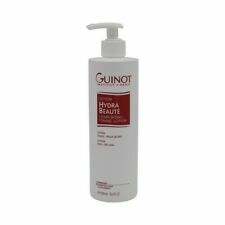 The Guinot Lotion Hydra Fraicheur will complete the removal of make-up that may be left after washing your face. Your skin will be left refreshed and feeling clean. Refreshing toning lotion suitable for all skin types. The Alcohol-free, non-lathering toner Hydra Fraîcheur completes make-up removal, tones and refreshes the skin. To be used after cleansing with Lait Hydra Fraîcheur.